What a massive space a tiny apartment can be. In A Raisin in the Sun, five people share two bedrooms, with a communal bath in the hallway. All family. A mother and her two children, a son and daughter, the son’s wife, and their child. Three generations of African Americans, with each intersecting lifeline representing different wants and needs. Walter Lee (Sidney Poitier, The World, The Flesh, and the Devil [review]) is a hard-working provider looking to be his own boss rather than drive cars for rich white men all his life. His younger sister, Beneatha (Diana Sands, The Landlord), is a dreamer in search of an identity, trying many hobbies but settling on being a doctor--relatively unheard of for a black woman in the early 1960s. The young Travis (Stephen Perry, The Sound and the Fury) represents a new hope, the link between old and young, while the family matriarch, Lena (Claudia McNeil, Black Girl), looks to maintain traditional values. 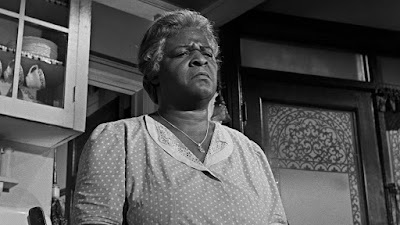 The real double-sided coin, however, is Lena and her daughter-in-law Ruth (Ruby Dee, Do The Right Thing). The two mothers really want to keep their family together, but the big difference between them is the older woman has a resolve built through years of hard work and belief, and the young women is starting to give up hope. Lena is determined to make everyone see that they should appreciate what they have--especially each other. So much going on in just three little rooms. A Raisin in the Sun was released in 1961, with author Lorraine Hansberry adapting her own successful stage play for journeyman filmmaker Daniel Petrie to direct. (Petrie will be known to Criterion fans for his versions of A Wind from the South and Bang the Drum Slowly on the Golden Age of Television set [review].) Both timely and frank, A Raisin in the Sun deftly draws together many strings of the African American experience of the period. Many factors pull at the Younger family, from changing opinions about faith to a growing disenchantment with the limited possibilities available to the impoverished and people of color. Beyond race, there are also issues of gender and questions of how individuals deal with one another. 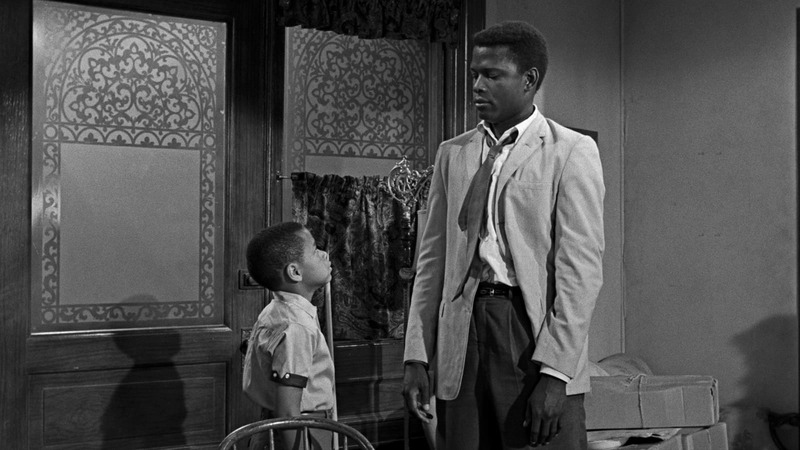 Poitier is combustible and restless as Walter Lee, a man who has never had much to call his own. Now in his mid-30s and still living with his mother, and his only son sleeping on a couch rather than having a bed in his own room, he’s desperate for an opportunity, and sees one in the insurance payment due to Lena following the death of Walter Lee’s father. He wants to take the $10,000 and start a liquor store with his friends. Ruth thinks it’s too risky, and Lena thinks it’s immoral. 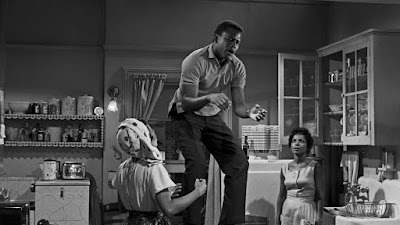 Poitier is physically set to burst with each rejection. All he can see are the things that are holding him back. By contrast, Claudia McNeil is unyielding and resolute. She speaks confidently, but with an even tone. She is comfortable in her position as head of the family, and firm in her beliefs. In terms of performance, she is a rock for Poitier and, to a degree, Diana Sands to attempt to climb, only to fall off time and again. She’s too stubborn, too squarely planted, for these youngsters to overcome, no matter how hard they fling themselves at her. 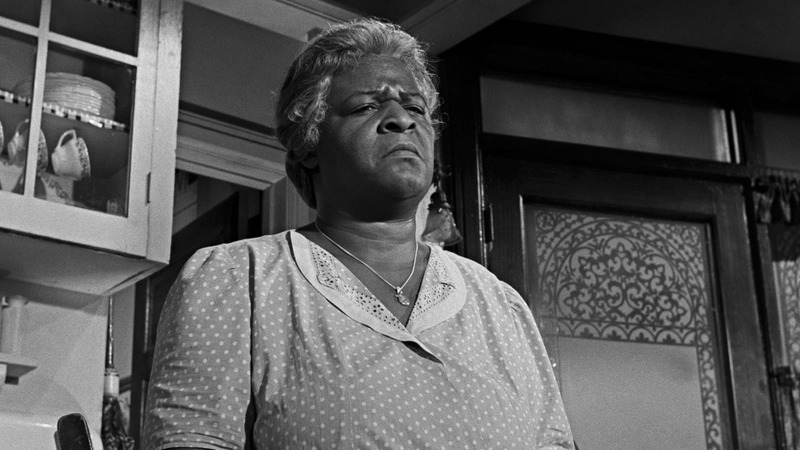 A Raisin in the Sun is confined in both space and time. The narrative takes place over only a couple of days, and outside of a few scenes in other locations, mostly connective tissue between acts, the action is exclusive in the apartment. While this is a holdover from the stage, Petrie doesn’t treat it as a limitation. He and cinematographer Charles Lawton Jr. (3:10 to Yuma [review]) move the camera to follow the characters, and the characters are so vibrant, even if the frame remained static, the movie would still hum with their energy. While each family member has their central driving motivation, their interaction allows for sidelines and vignettes, sequences that round out who they are more than forwarding the narrative, allowing for both humor and drama. Beneatha in particular has some funny scenes as different gentlemen callers come around. She is as flighty as Walter Lee is single-minded, and though they bicker like siblings only can, it’s fun to see them stop squabbling to goof around when Beneatha is exploring African music and dance. This strikes me as a very honest way to portray a family. A unit like this can switch on a dime, at odds one minute and coming together for a common cause the next. In the film’s final scenes, we see how far that sort of bond can be pushed, and at a point where it really counts. 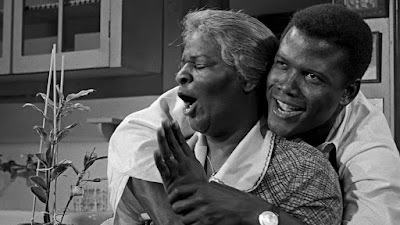 Walter Lee can stand up and be the man he is meant to be, an example to his son, a point of pride for his mother. 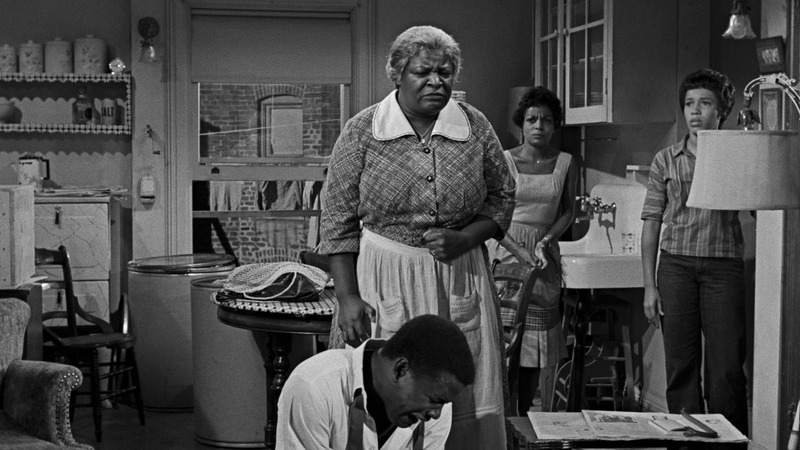 Most of the problems raised in A Raisin in the Sun are sadly still relevant: economic independence being out of reach, racial perception creating boundaries where there should be none, the pressure of poverty on a family. When Ruth turns out to be pregnant again, it’s less a cause for celebration and more one of concern. 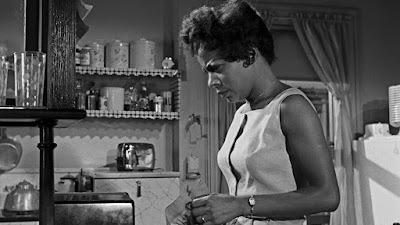 In many ways, the bluntness with which Hansberry approaches issues like abortion reminds me of British kitchen sink dramas, like A Taste of Honey [review] or This Sporting Life [review]. Why couch taboo subjects in coded language when so many members of the audience are going through the same thing? 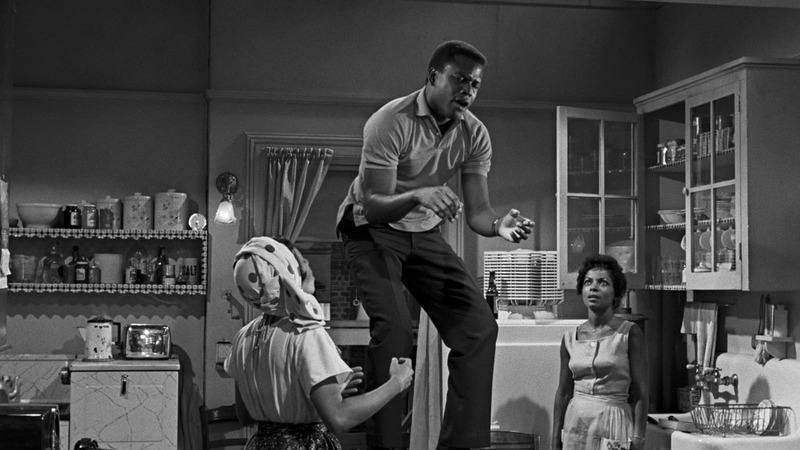 This is what allows A Raisin in the Sun to remain timeless: its specificity is universal. To be less true would have neutered it. 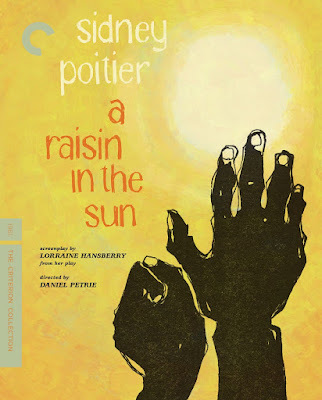 For this new release, Criterion has created a beautiful 4K image with nicely balanced black-and-white photography. They’ve also packed the disc with lots of special features, both old and new, to explore the history of A Raisin in the Sun as a piece of theater and as cinema, and look at the people who brought it to life.